According to the docs, a plan is – an abstraction between applications (the clients consuming APIs) and APIs to allow fine-grained access entitlements to all APIs that are part of a plan. this with a plan. All this is done in the APIP CS Developer Portal. 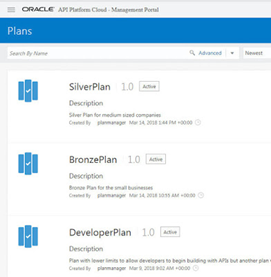 There is a new role in APIP CS to manage plans – Plan Manager. I login to the Management Portal as such – Read the complete article here.